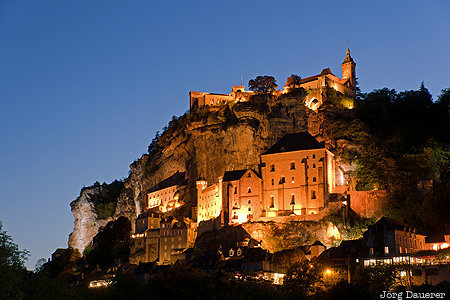 The flood-lit city of Rocamadour built on a steep rock at the blue hour after sunset. Rocamadour is in the Département Lot in the region Midi-Pyrénées in central France. This photo was taken in the evening of a sunny day in September of 2015. This photo is part of the exhibition Blue Hour (October 2016). This photo was taken with a digital camera.